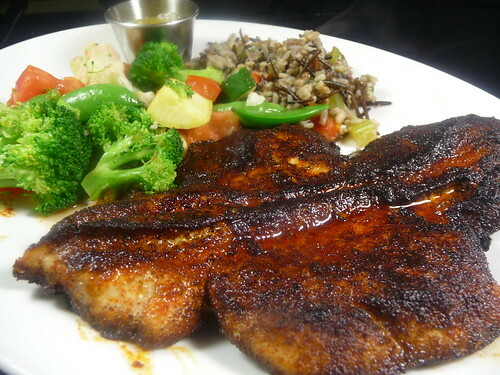 Attributing to the lenten season, we are now offering blackened Amberjack for a limited time. Amberjack is a fish mostly found in the warm waters of the Mediterranean and Caribbean along with the southeastern coast of the United States. It is not allowed to be fished for during the summer months. Known for its firm texture and white meat, this fish is extremely lean compared to most other fish, giving it a slightly sweeter taste. Weighing between 15 to 150 pounds and up to six feet long, the smallest Amberjacks are typically sought after, believing to have the better taste compared to the large ones. While the small ones are sought after, we would never serve a small portion! We serve a large 10 oz. portion prepared with traditional blackening methods. Made popular in the southern Cajun regions of the United States, blackening is the process of coating fish or meat in a variety of herbs and spices and searing it in a very hot cast-iron skillet. Our blackened Amberjack is served with drawn butter and is accompanied by roasted rosemary and garlic red potatoes along with our seasonal vegetable of tri-colored carrots and shallots sauteed in a light maple glaze. Give your tastebuds a break from the traditional Friday night fare. Make sure you grab a bite of the Amberjack while you still can!